Airedale Springs are able to produce and supply a wide range of hose springs, thanks to our extensive manufacturing facilities in Yorkshire. We have developed cutting edge production methods which, combined with the high-quality materials we use in all of our products, allow us to produce hose springs with a constant pitch even under very small extension. 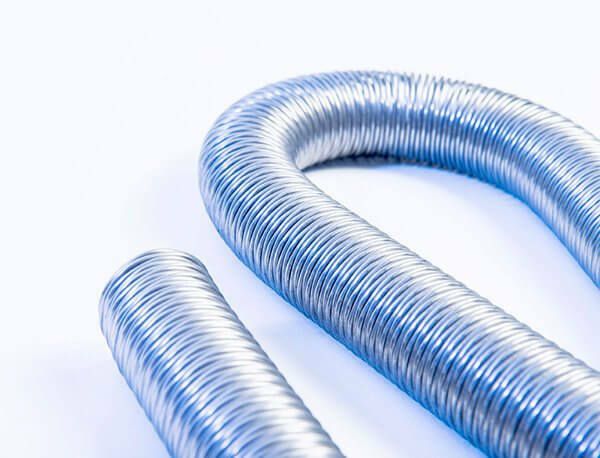 Such reliable performance is a key requirement for hose springs used in vacuum cleaner hoses, and in many other applications. Hose springs can be produced with constant open pitching, as typically used for cable armouring and water filtration systems. Whatever your requirements, and whatever the final application may be, by consulting with our highly experienced team we’ll be able to offer you the most appropriate solution. Our CNC equipment and specialized tooling now allows us to manufacture hose springs used as filters with out of round shapes such as square or octagonal and with variable and none variable pitch within the same spring. As with all of our products, we use superior materials and finishes to make our hose springs and operate rigorous quality control, giving you a reliable finished product that precisely suits your needs. You can order hose springs pre-cut to length for specific applications, or for the ongoing convenience of bulk requirements it can be supplied in long lengths for you to cut down as required. Components can be supplied in a variety of packaging suitable for the protection of this type of spring. Long lengths up to 3 meters can be supplied in cardboard tubes to maximise protection and reduce distortion. At Airedale Springs, we pride ourselves on our reputation for high-quality products and excellent service. Whether you need standard springs produced in bulk, a small batch or even a one-off order, our flexible service allows us to offer you the right solutions at the right prices. For more information on any of our products, from hose springs to wire forms, simply get in touch to speak to our team. It’s helpful to know where a spring is designed to fit and what the sizes of the hole and shaft are. Please also let us know of any other important dimensions.